Douglas Adams was a frood who really knew where his towel was. He was also one of Britain’s best comedy writers, a keen conservationist and is the subject of a new book by Jem Roberts – The Frood: The Authorised and Very Official History of Douglas Adams and The Hitchhiker’s Guide To The Galaxy. Just for a bit of background – this review may be slightly biased. Placing a book about Douglas Adams in my hands is not entirely unlike placing a block of cheese in the hands of a hungry mouse (whether the block of cheese is actually very small or the mouse very large is not important. But I like your imagination). I was hooked on The Hitchhiker’s Guide To The Galaxy from the moment I could work out how to turn on a radio. Later I found that Adams had turned the cult radio show into a series of books – I learnt to read for no other reason. Later still I discovered the TV show and Adams’ other books. So I’m a lifelong fan, and any book about the Grandmaster of Comedy will immediately gain a foothold in my library (if library is defined as a large plywood bookcase held together by duct tape and physics). Douglas Adams was a large man with a penchant for Apple products (before they were cool), digital watches (which were a neat idea) and animals (which are an even neater idea). Jem Roberts’ new book takes us from Douglas’ early days writing with Monty Python’s Graham Chapman, through his work as Script Editor on Doctor Who and his ground-breaking work on video games in the early eighties. It reveals a writer plagued by self-doubt who has expanded the cerebellums of readers/listeners/viewers across time and space, a scribe haunted by the sound of deadlines whooshing past. But it was Adams’ love of conservation that really made him a hoopy frood (for those unfamiliar with the Hitchhiker’s Universe – hoopy is a really together guy and a frood is a really amazingly together guy. Simple, really). This new book reveals how Douglas first encountered endangered Aye-ayes in Madagascar in 1985 while writing an article for Observer Colour Magazine. The trip opened our young and impressionable writer’s eye-eyes to the plight of animals on the brink of extinction, but just as importantly he met zoologist Mark Carwardine. 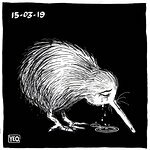 The result: a BBC radio show and book called Last Chance To See, which featured the pair as they travelled the globe searching for rare animals such as the elusive Kakapo in New Zealand and the Northern White Rhinos of the Garamba National Park. It was a endeavor that led to renewed and increased conservation efforts around the world, and resulted in a follow-up project – 20 years later and eight years after Douglas’ death at the age of 49 – fronted by Mark Carwardine and Stephen Fry that revisited the same species to see how they were getting on (in the case of the Yangtze River Dolphin and the Northern White Rhino, they didn’t appear to be getting on very well at all). In 1994, Douglas became patron of Save the Rhino, an organisation dedicated to – funnily enough – saving the rhino. He was a dedicated and passionate supporter of the charity until his death in 2001. Since 2003, Save The Rhino has held an annual Douglas Adams Memorial Lecture – next year’s event will feature the author of an earlier biography about Douglas, Neil Gaiman. Save the Rhino will also celebrate its 21st birthday in November with a special event featuring Mark Carwardine. Douglas has also inspired the establishment of the Hitchhiker's Guide to the Galaxy Foundation, which makes grants to small charities to benefit literacy. As Jem Roberts points out in his book, Douglas wanted to do as much good in this world as he could, so it is up to his fans to continue his legacy. For those who want to immerse themselves more fully in the Hitchhiker’s Universe, Jem Roberts has provided the perfect starting point. For fans who miss all things Douglasy, it fills a huge gap left vacant by a huge talent. 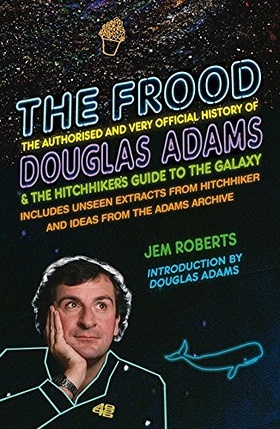 The Frood: The Authorised and Very Official History of Douglas Adams and The Hitchhiker’s Guide To The Galaxy by Jem Roberts is available from Amazon.com and Amazon.co.uk, as well as wherever hoopy books are sold.